The battle against fine lines and wrinkles can seem to be never ending, making the search for an effective anti-aging skin care program a priority for many people. That's why I was so excited when NuSkin sent me an ageLOC® Transformation skin care system to try and review as LoveToKnow's Beauty and Style editor. Being in my mid-40s, I am always looking for skincare solutions designed to slow or reverse the signs of aging. 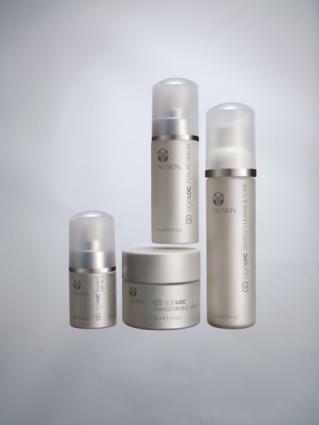 NuSkin promotes the ageLOC Transformation line as a complete, comprehensive, scientifically-sound skin care system that can result in younger looking skin within seven days of use. Having seen similar claims on other systems I have tried in the past that did not deliver, I was quite skeptical about whether such dramatic results would really be possible. Should I Use Vitamin C and Hyaluronic Acid Serum? It did not take long for me to see that the marketing claims about this particular product are spot on. Within five days of using the product, I noticed that several lines around the outside of my eyes had diminished in size and that my skin had more brightness than usual. Several people that I see regularly commented on the change, so I can confidently say that I am not the only one who noticed a difference. Note: While NuSkin did provide me with product to review at no cost, the opinions presented in this independent product review are my own. The ageLOC Transformation System is easy to use. There are four products in the line and you need to use all of them for desired results. They are simple to apply and the routine of applying is no different from what you would expect from any skin care system. The products include a combination cleansing/toning product, future serum, and different moisturizers for daytime and evening use. This combination cleanser and toner should be used every morning and every evening as the first step in the Transformation System. It gently cleans and purifies skin without drying. It is designed to preserve natural moisture. It's appropriate for use on all skin types. I found it to be an effective cleanser that feels great going on while being very easy to rinse off. Applying Future Serum is the second step in the Transformation System and should be applied morning and evening. The serum is relatively thick, yet does not feel greasy or heavy when applied. It is made with a patent ingredient technology designed to promote youthful appearance by increasing collagen production by 150 percent. The association between collagen production and skin aging is widely recognized. Scientific American shares that the slowing of collagen production is recognized as a factor in the appearance of aging skin. An article on SmartSkinCare.com indicates that stimulating collagen production can reverse the processes that lead to wrinkles, skin sagging and roughening skin texture. Radiant Day moisturizer should be used after applying Future Serum in the morning. It is an ant-aging moisturizer that includes broad spectrum UVA and UVB protection with a sun protection factor of 22. The formula includes ingredients designed to reduce the appearance of fine lines and wrinkles, stimulate the turnover of youthful skin cells, and brighten skin by reducing unwanted melanin production. Formulated to be used under makeup, the moisturizer absorbs very quickly. It does not have a greasy or heavy feel at all. I have always had normal skin that has started to get a bit dryer over the last few years and found the consistency to be very easy to work with and soothing to my skin. Intended for evening use, Transforming Night moisturizer's formula is designed to improve the skin's ability to renew and repair overnight. Like the daytime moisturizer, it has anti-aging properties and is also designed to reduce skin sensitivity and promote resilience. Even though it is thicker than the daytime moisturizer, it absorbs very quickly and also does not feel greasy at all. I found it to be very cooling and soothing. High-end skincare lines are not low-cost, and NuSkin is certainly not at the lower end of the price point spectrum. Based on my experience, the product is very effective and does what the company claims, something I have not always found to be true with other anti-aging skincare products. The fact that the product works well and delivers as promises is a definite "plus" with this product. The price, however, can be a deterrent. The system that I tried retails for $385 for a 30-day supply. It's certainly more expensive than many other lines, but much less expensive than medical procedures designed to reduce the visible signs of aging. If you are looking for a scientifically-based anti-aging system that delivers powerful results and you can afford the cost, you may find that the NuSkin ageLOC Transformation System is what you are searching for. ageLOC can be ordered online or purchased from an independent consultant. If you are ready to try the product for yourself, visit NuSkin.com to order.